HomeChristian Science2018 Healing 101 Series is off to a good start! We’re pleased to once again be providing the technical support for the Healing 101 Series of talks. 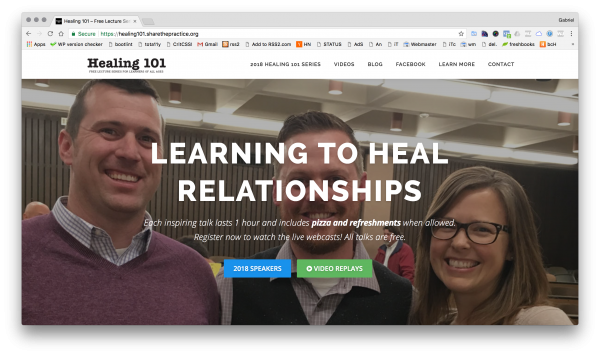 This is the 3rd year we’ve participated by filming, hosting the live webinar, editing the replay videos and publishing them on the healing101.sharethepractice.org site and our YouTube channel. We redesigned the site this year for better long-term accessibility and mobile-friendly display. You can easily access all the lecture replays there. The mailing list has grown to over 1,000 subscribers, and the Facebook page has over 500 likes. As of April 2018, over 1.4 million minutes of Healing 101 talks have been viewed on our channel. Pretty cool!